A performance SSD worthy of a case window. 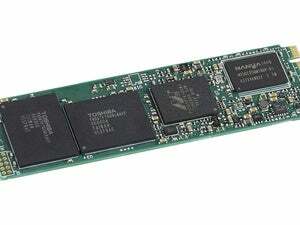 If you have a PCIe slot in your PC, or an M.2 slot that supports PCIe in your laptop, you really should upgrade to an NVMe drive such as Plextor’s M8Pe. Why? Outrageously quick access times, 2GBps reads, and 1GBps writes. That’s roughly 15 times and 10 times the speed of a hard drive, respectively. The difference in the feel of your PC will amaze. That’s of course assuming you can boot from an NVMe drive, something many mainstream PCs are incapable of, unfortunately. But if you have a BIOS that can handle it, the Plextor M8Pe will not only deliver that scintillating performance, it will look good while doing it. Designed with gamers in mind, the M8Pe’s sleek red-and-black heatsink makes it look fast even before you turn it on. Hit the juice, and the triangular dome lights up, as red LEDs peek out from the top edge to flash the device’s status. Ooh. Ah! 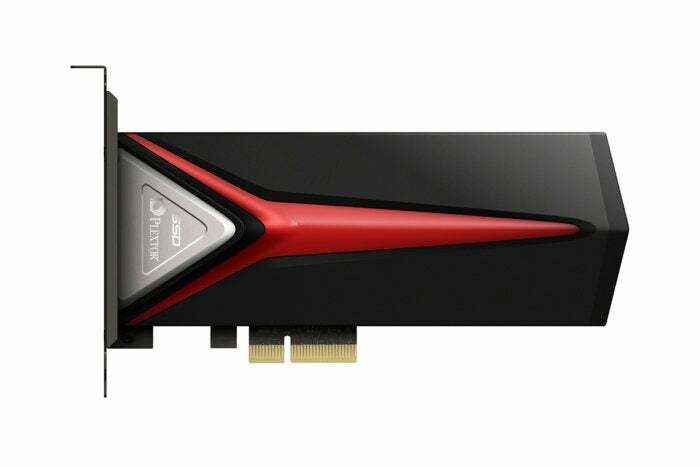 A side view of Plextor’s fast M8Pe PCIe/NVMe SSD. The M8Pe performs as advertised: 2GBps reads, 1GBps writes, and application windows that appear quicker than expected. That was true in our real-world 20GB copy tests, and CrystalDiskMark agreed with those results. But AS SSD showed the drive as writing at just 300MBps. Huh? The thing is, all the tests were correct. Turning off Windows write caching for the M8Pe brought CrystalDiskMark into agreement with AS SSD’s lower number. We’ve seen this issue before, and it’s typically remedied by installing a driver. Plextor doesn’t provide a proprietary driver though, instead relying on the native Microsoft NVMe driver. 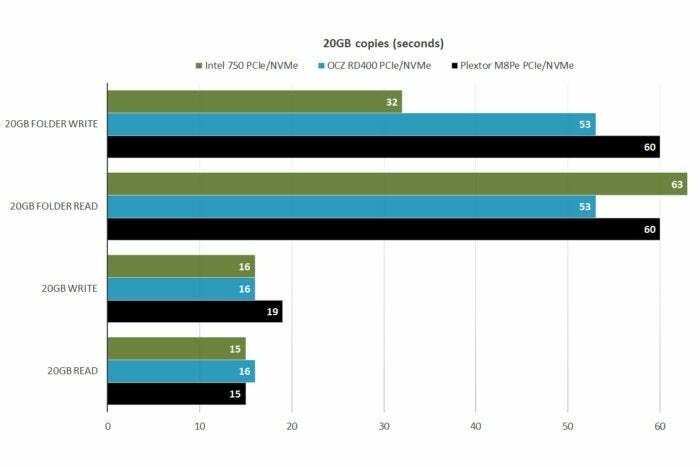 A very fast reader, but not as fast writing as other PCIe/NVMe drives on adapter cards we’ve tested. Note that the OCZ RD400 and Intel 750 use their own drivers, while the M8Pe uses the native Windows NVMe driver. The difference is the FUA, or Forced Unit Access, command issued by AS SSD, as well as Windows when write caching is turned off. FUA tells the driver and SSD to write directly to the NAND, bypassing Window’s own RAM cache as well as the 512MB of DRAM cache on our 512GB test M8Pe. This eliminates any danger of data loss when the power fails. But writing to NAND is a far slower process than writing to DRAM (or reading from NAND) hence the significantly reduced write performance when FUA is in effect. Proprietary drivers of the past have ignored the FUA command, hence the huge disparity in performance when using those drivers and the native Windows driver. 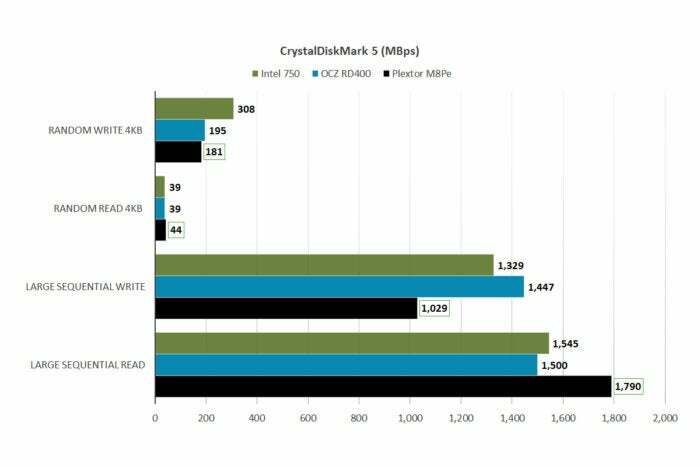 Think of AS SSD as testing the absolute speed of a drive’s NAND (Toshiba 15nm toggle MLC with a Marvell 88SS1093 controller in this instance), CrystalDiskMark as your best case scenario, and our real-world copy tests as what you’ll actually experience. It’s not the fastest in any test other than the 20GB write, but the M8Pe is clearly competitive in all phases. Note: Because of smaller cache size and other factors, the lower-capacity M8Pe models are slower, and the 1TB capacity drive is a bit faster. They’re all fast compared to SATA, but you can find a listing of the differences at Plextor’s website. Plextor didn’t provide retail pricing, but we saw the 512GB version on Amazon for $240. That’s about 46 cents per gigabyte. Considering that’s what SATA SSDs cost not too long ago, that’s pretty reasonable. Remember, we’re talking roughly four times the read speed and twice the write speed of SATA. The M8Pe with its cover/heatsink removed. Plextor warranties the M8Pe for five years and 128GB, 256GB, 512GB/1TB drives for 192 TBW, 384 TBW, and 768 TBW (terabytes written), respectively. Yes, you get slightly jobbed on the 1TB unit. Not that you’re likely to write even close to that amount of data in five years, or even 10 years in most cases. 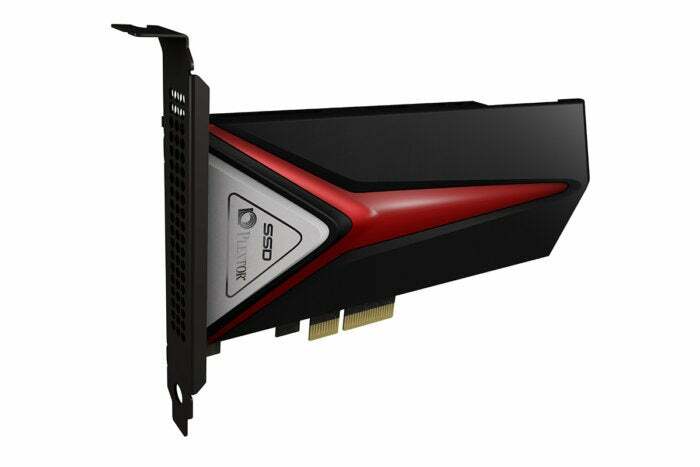 The M8Pe is a worthy competitor to OCZ’s RD400, and quite a bit cheaper than the Intel 750—a very good product, in other words. 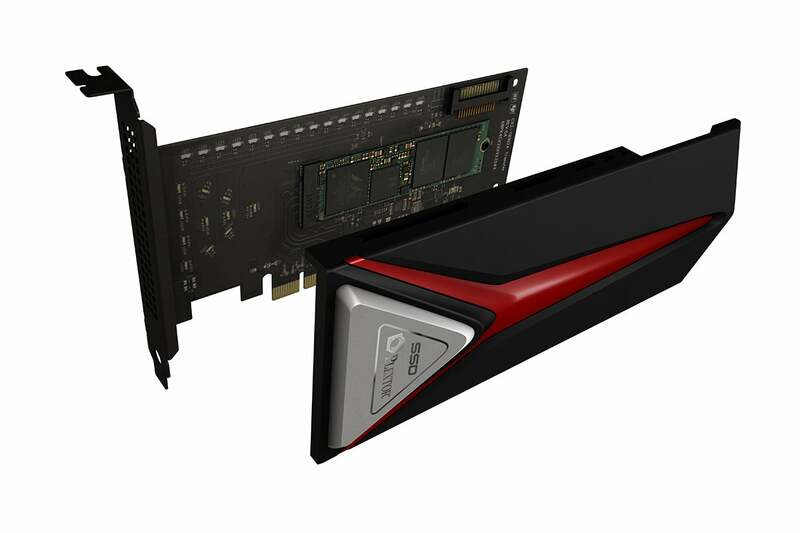 And it’s the sexiest-looking PCIe card SSD out there, if that means anything to you.